‘From Mother To Daughter’ is about motherhood, what you learn as a mother, the things you would tell your daughter and most of all, it’s Katie and Diane Piper’s celebration of the incredible power of mother-daughter relationships. Especially relevant as Katie has just had her beautiful second daughter Penelope. It also gives readers the first and only chance to read Diane’s private diary entries penned in the toughest times of their relationship. “Whether you’re becoming a mum for the first time or you have children who are growing up faster than you could have ever imagined, motherhood can feel like the most joyful and yet the most daunting of times. But you’re not alone. From Mother to Daughter is about motherhood, what you learn as a mother, the things you would tell your daughter and most of all its Katie and Diane Piper’s celebration of the incredible power of mother-daughter relationships. It also gives readers the first and only chance to read Diane’s private diary entries penned in the toughest times of their relationship post Katie’s attack in 2008. 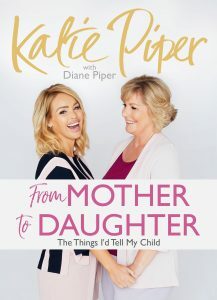 Katie Piper’s first book on motherhood – and the first of its kind by a celebrity author and mother dealing with serious, topical issues girls and teenagers face today. Motherhood is a universal and relatable subject that concerns us all – and this is a timely next book from Katie Piper as she recently became a mother for the second time. In a beautiful hardback format, From Mother to Daughter makes the perfect gift.